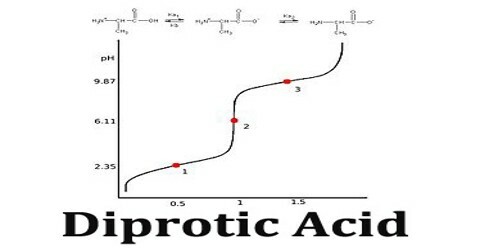 Diprotic acid is a type of polyprotic acid; it can undergo one or two dissociations depending on the pH. It is an acid that can donate two proton or hydrogen atoms per molecule to an aqueous solution. The most important chemical feature for a diprotic acid molecule is its ability to deprotonate two protons in two sequential steps during dissociation. Most diprotic acids are common acids which are used everyday in many different areas. Also, they exist everywhere in nature, such as in human bodies. A proton is a positively charged hydrogen atom, while an acid is a compound that releases a proton. Acids that are able to release more than a single proton are known as polyprotic acids. One particular kind of polyprotic acid is diprotic acid. 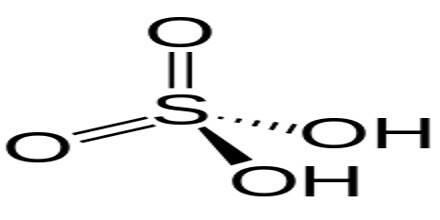 Sulfuric acid (Hsub2SOsub4), hydrogen sulfide (Hsub2S), carbonic acid (Hsub2COsub3), chromic acid (Hsub2CrOsub4), and oxalic acid (Hsub2Csub2Osub4) are all examples of diprotic acids. Some other inorganic diprotic acids such as hydrosulfuric acid (H2S) usually have two hydrogen atoms linked to an electronegative center in each molecular. Dicarboxylic acids have a general molecular formula HOOC-R-COOH. 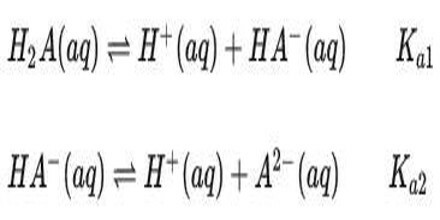 The value of Ka is at least one hundred times larger than the value of Ka This is mainly because that more energy is required to remove a positively charged proton from HA with a negative charge in the above equation, and than from HA which is electric neutral in the above equation. This phenomenon can also be demonstrated by Pauling’s first rule. The first dissociation constant is necessarily greater than the second (Ka1 > Ka2); this is because the first proton to dissociate is always the most strongly acidic, followed in order by the next most strongly acidic proton. 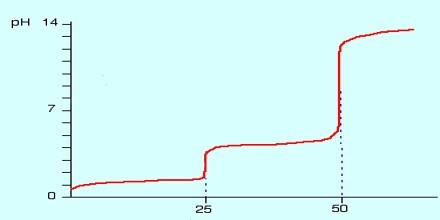 A titration curve of a diprotic acid titrated by a base has two axis, with the base volume on the x-axis and the solution’s pH value on the y-axis.The pH of the solution always goes up as the base is added to the solution. For each diprotic acid titration curve, from left to right, there are two midpoints, two equivalence points, and two buffer regions. Reference: thoughtco.com, study.com, boundless.com, wikipedia.